In this article we explore the seismic shift that is occurring in digital advertising as a result of cognitive computing, social media, and mobile technologies. We come to this topic somewhat accidentally and is largely based on recent personal experiences in online shopping. In our case, we had been considering some major purchases and had done some initial research on the web and for days and weeks afterward had been bombarded with the brand ads everywhere we went on the internet. The extent of the advertising footprint led us to consider and examine the radical changes taking place in ad personalization and customization. It is our position that the next wave of personalization will do much more than simply selecting relevant ads based on user profiles and IP addresses, but will allow for dynamic ad content creation based on personality profiling and tone analysis. A landscape that will be hypertuned and personalized and less ‘vanilla’. In the early days of digital advertising, content providers focused on selling ad real-estate via banner ads to subsidize or offset the cost of creating premium content for users. This opened up new opportunities for marketers to capitalize on audience specific demographics based upon the content being provided by a web site. This perspective really changed the whole advertising world as it enabled ad seekers to better identify their target markets and obtain better results versus blindly placing ads. The real revolution though came from the introduction of technology to count and collect views and clicks on ads. This enabled marketers to get near instantaneous feedback on how effective an ad campaign was performing without having to wait until the campaign was over to gauge effectiveness. This real time nature also had an impact on how advertisers paid for ads. With banner ads, advertisers typically paid a flat fee to host the ad for some set specific period of time. With the ability to gauge ad effectiveness, however, the monetization model shifted to one based on actual views and clicks. As the number of sites on the internet exploded, advertisers saw this as an opportunity to utilize search engines as a means to gain even greater granularity into targeting specific demographic groups based upon search queries. Services such as Google’s AdWords and Facebook Paid Ads enabled advertisers to bid on keywords that they want to associate with their ads to better match their targeted demographic and get their website ranked higher in search results. To gain even more effectiveness in ad campaigns, advertisers desired to garner as much information about users as possible to better align their ads to their targeted demographic. This became possible via cookies that allowed marketers to track both web sites visited as well as an individual’s search history. This information is frequently used to build profiles of users and infer social behaviors as well as other demographics. With these profiles, advertisers can use this information to target specific consumer groups and have ads follow users wherever they go through remarketing. It is at this point that we start to see users express concern around data privacy and use of personally identifying information. Naturally, the use of personally identifying information is not unique to the online world. One example of using personally identifying information comes from Target. A Target marketing analyst had the assignment and mission to tap Target’s deep treasure trove of data, namely their own data tied to the Target Guest ID number, which included data related to Target activities, such as credit card usage, survey information, and customer help line data. Also linked to this master ID was demographical information as well as more ‘exotic’ data that Target could buy and procure, as an example, the magazines you read, if you’ve ever declared bankruptcy, what types of coffee brands you prefer, and political leanings. Based upon some early analysis, Target learned that there was a strong linkage between unscented lotion and the beginning of a woman’s second trimester of pregnancy. Additionally, they learned that pregnant women purchased large quantities of supplements like calcium in the first 20 weeks of pregnancy. From this analysis, Target was able to predict someone’s pregnancy based upon analyzing sales information of 25 products. Based on these findings, Target decided to start sending out baby-related coupons to women that they believed were likely to be pregnant. One recipient of these coupons happened to be a teenage girl that was still in high school. The parents having noticed that their daughter was receiving these coupons contacted Target to launch a complaint that Target was actively trying to encourage their daughter to have a child. Only a few weeks later the parents learned that their daughter was actually pregnant. One can only imagine the kinds of predictions that will be possible when traditional, personally-identifying information is combined with information that can be captured online. Some companies, however, have undertaken a more direct approach, where people are compensated for providing their data to better develop user profiles. This has included data points that go beyond the typical web sites visited and browser search history, but has included purchase history, emails, texts, and in some cases even banking information. One example of this strategy comes from Sears. Sears Holdings, invited some users of sears.com and kmart.com to become members of a special group of customers that allowed Sears to have access to personal information in exchange for paying them $10. Sears asked these customers to “participate in exciting, engaging, and ongoing interactions — always on your terms and always by your choice.” All the consumer had to do was download ‘research’ software that would track what turned out to be their every move. Information collected and transmitted included all of the customers’ web browsing (not just Sears sites), online purchases, business transacted during secure sessions, online banking data, completion of online application forms, and some of the customers’ web-based email and instant messages. Data collected included some offline computer usage as well. This type of data collection activity caught the attention of the Federal Trade Commission (FTC). The FTC subsequently launched a complaint that Sears’ actions were unfair and deceptive. They felt that Sears did not adequately disclose the actual functions of the tracking application and that a reasonable understanding of the functions would be material to consumers when deciding whether to participate in the community. The FTC determined that Sears’ failure to disclose the program details in a more clear, prominent and meaningful manner constituted unfair or deceptive acts. In the Sears matter, the FTC indicated that the crux of the issue was the inadequately disclosed collection of sensitive data (including bank account information). With the growing use of social media, even greater amounts of personal information are able to be collected and analyzed that go beyond the type of information that had been collected through research software, as in the case of Sears. This has provided advertisers with yet even more capability to target specific demographic groups. Social media platforms, like Facebook and Snapchat, have the ability to collect more specific data points than could ever be possible through technology like cookies. Facebook for example, is able to obtain upwards of nearly 100 specific pieces of information on a user. These data points go beyond the basics, like age and the city you live in, and includes details such as your relationship status, political affiliation, and even whether or not you have a debit card. With these type of details, marketers have a lot of information to draw upon to create highly effective ad campaigns that are personalized and timely. As in the Target and Sears examples as well as with Facebook, where part of the data set is purchased and other data points are inferred, the interdependency is on data brokers. Data brokers are companies that collect consumers’ personal information and resell or share that data with others. In today’s world of targeted consumer advertising and marketing, going deep on vast troves of data is big business. Among the giant data brokerage houses include such ‘household’ names as Acxiom and Experian. But the industry is somewhat a shadow market in which companies keep a low profile and real numbers of data brokers are hard to come by. Credible estimates are in the range of 2,500 to 4,000 data brokerage companies in the U.S. Some of the smaller companies include Exact Data and Datalogix. Data sources for the brokers include the obvious, like web browsing habits, as well as myriad online sources, such as blog posts and certain social media data, like screen names and interests. Offline sources are bountiful as well, and include court and other public records including voting records and even department of motor vehicle records, in some cases. Additionally, some retailers sell sales records to brokers. Datalogix, for example, procures and sells data from store loyalty cards. They contend they have information on over $1T in consumer spending across 1400 leading brands. Broker companies then take this online and offline data and aggregate it to form a holistic profile. Datalogix has partnered with Facebook as an example, to track whether Facebook users who see ads for certain products end up actually buying them in stores. These data can then be packaged and sold to retailers to help drive online and/or offline traffic. Now that social media platforms and data brokers are able to formulate precise pictures of individuals that include much more than their buying habits, how might these new insights be used to increase ad effectiveness? We said that a seismic shift in digital marketing was occurring, yet we did not fully describe this shift. Before describing this shift, we will first set the stage as to why a change is happening. Over the last few years, the growth and sophistication of ad blocking software has started to greatly impact the effectiveness of ad remarketing. 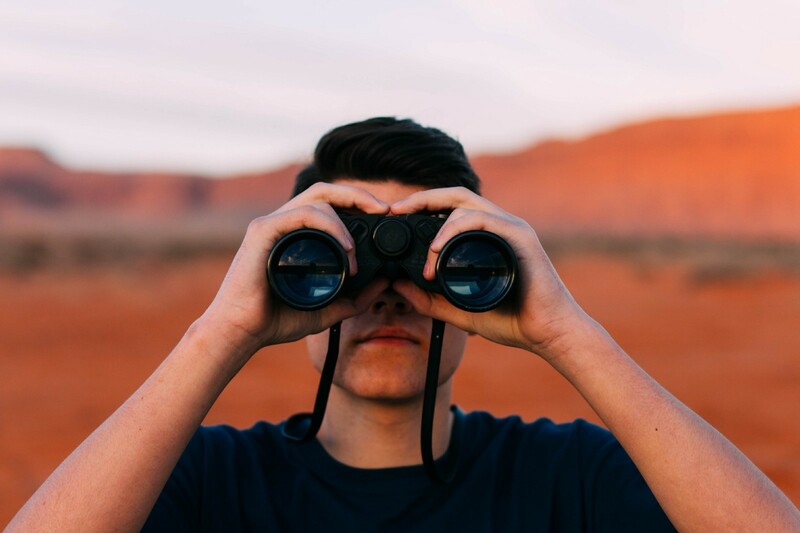 When you couple that with software that helps to eliminate cookie tracking, advertisers are faced with a real dilemma of how to effectively reach customers. This has caused marketers to turn to social media as a source of their advertising campaigns. When we look at how effective social media ad campaigns are, we find that they can be effective. Evidence suggests that successful leads are being generated via social media and when users follow a particular brand they are more likely to purchase goods and services. Though these ads have shown to be effective, technology is being developed that can block such ads, thereby limiting the efficacy of such campaigns. How might an organization work to advertise and sell around such blocks? One means to sell around such blocks is to create advertising content that has an editorial feel — thereby blurring the lines between legitimate news/content (non-advertised material) and advertisements. We’ve all heard how such ‘fake news’ may have swung or slanted the recent election. Advertisers are using such tactics to drive click rates and ultimately convert to sales. The ‘marrying’ of such fake or blurred news with social media sites is where marketing horsepower can lie. A specific example of a tactic that blurs the lines between real and fake is native advertising, a type of ad that resembles the form and function of the platform on which it resides. There may be no better example of the utilization of this form of advertising than with Buzzfeed. The site derives much of its revenues from this source of advertisement. The challenge with such ads is that readers often cannot differentiate between the ads and real news. 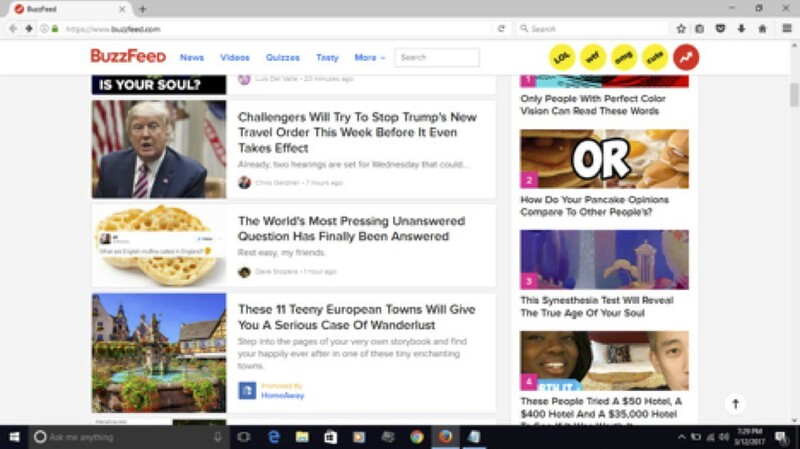 In the case of Buzzfeed, ‘legitimate’ stories intermingle seamlessly with advertised articles, as in the following example. While native ads aren’t going away anytime soon (BI Intelligence reports that by 2021, native display ad revenue in the U.S. will make up 74% of total US display ad revenue, up from a 56% share in 2016) it is also no guarantee of success. Buzzfeed has been missing revenue projections of late. The rise and dominance of Instagram is another means and opportunity for companies to directly reach audiences to market and ultimately sell to. While requiring a few extra clicks beyond the Instagram site to shop for products seen on Instagram, some companies are making it as easy as possible to buy the items seen on their feeds. 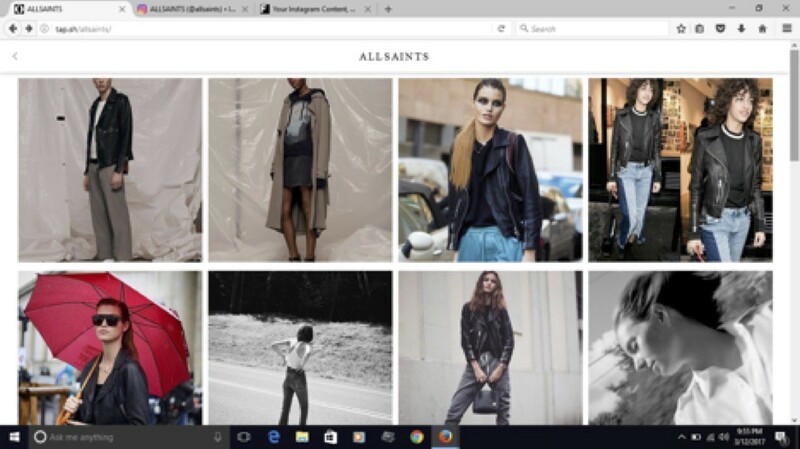 Take for example UK-based fashion label AllSaints. The company uses its Instagram account to reach customers directly and allows them an outlet to purchase what they see on its Instagram feed (as depicted in following images). 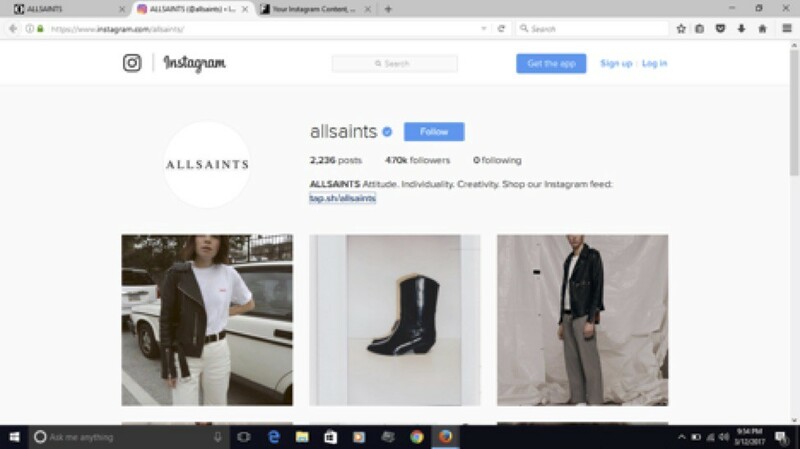 While not unique — other companies do this as well — AllSaints sees and uses Instagram as a primary outreach and shopping channel for its customers with its over 407,000 Instagram followers. As a point of reference, Zara with over 16 million followers does not link its Instagram account with the ability to make purchases from its feed. According to social media analytics firm Socialbakers, AllSaints holds the 5th place in interactions, ahead of Zara (545,903 AllSaints interactions, defined as the sum of likes and comments). Buzzfeed and the other examples are advertising tactics that we experience today, but what might the advertising landscape look like in the future. This is where cognitive computing and evolutionary algorithms come in. Evolutionary Algorithms — a computer program that is designed to evolve and improve in response to input — morph content to better suit existing user bases. These algorithms improve performance on an ongoing basis. Cognitive computing is a broad collection of services that employ deep learning to better identify trends, gain insight, and make predictions about future events. These services are often born on the cloud (internet) and, just like evolutionary algorithms, they continuously evolve and improve over time. The types of analyses that these services perform run the gamut, from data analytics to text sentiment and personality identification examples include Microsoft’s Text Analytics API service and IBM’s Watson Discovery service. These cognitive services reveal deeper insights into the psychology of language and the tone and tenor being expressed in text, such as one’s social media and related footprint, e.g., email, Twitter, Instagram, etc. With these services, it is possible to gain deeper insight into advertising content and ultimately to targeted customer bases. With this insight, content can be matched against an individual’s Facebook (and related) profile; specifically, an advertiser could perform a semantic analysis of the advertising copy and text to determine the ad’s personality profile, the overall tone or emotion being expressed in the ad, as well as any distinct alignment with social tendencies. The advertiser could then compare this analysis with an individual’s Facebook profile to see how the ad copy could be modified to target a specific personality type that could be representative of a unique demographic. A more sophisticated approach to ad targeting would be to tune the ad copy dynamically to fit a user’s profile rather than simply identifying whether an ad fits a user’s profile. In this approach premade paragraphs, images, and even audio files could be pieced together on the fly to best suit an individual’s specific personality attributes that is personalized, relevant, and timely (hyper-local); think immersive augmented reality marketing. This could be accomplished by using artificial intelligence services, a prominent platform being IBM Watson and specifically, IBM’s Watson Personality Insights and Watson Tone Analyzer. These services enable the construction of ad copy in an agile or iterative fashion where an author can make small adjustments and then quickly gauge the impact of different phrases and words on the overall personality traits being expressed in the text. 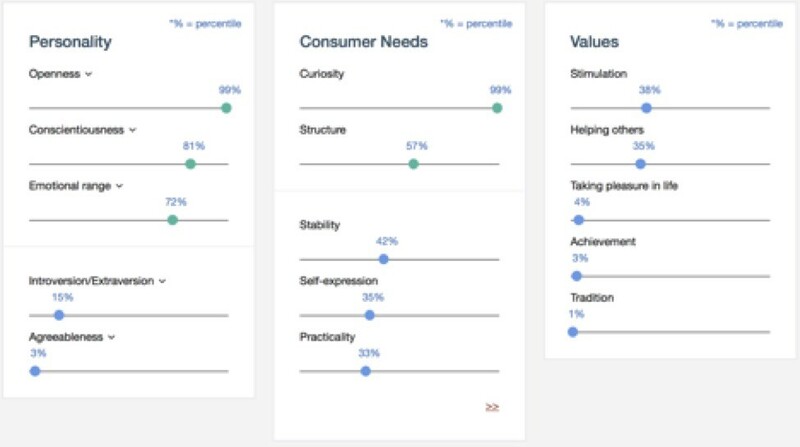 To get a better understanding of the type of information that these cognitive systems provide, we have provided screen captures from IBM’s Watson Personality and Watson Tone Analyzer services. We also have provided screenshots from the University of Cambridge’s “Apply Magic Sauce Tool” for use in identifying a user’s personality from Facebook. From these tools, we can assess emotional range: joy, fear, sadness, disgust, and anger being expressed in social media text content, along with the Big 5 personality traits — openness to experience, conscientiousness, extroversion, agreeableness, and neuroticism. Companies such as SocialBro use Watson to visualize personality traits to improve targeting and relevance of Twitter advertising. In the future, advertising will be made relevant down to the individual and will be dynamic; through social media and related activities, such as email, advertisers will know before an individual has acknowledged their own buying cycle what someone is looking to buy, the brands, the timing and the quality being considered. Gone will be the days of being sent irrelevant ads and emails or being bombarded by incessant ads for products that one has clicked through to on the internet preliminarily. The advertising wave of the future will know more about us than we may acknowledge within ourselves and will be customized and tailored on the fly by brand marketers. A brave, new advertising future awaits us all. Complaint at 5, Sears Holdings Mgmt. Corp., File №082 3099 (Fed. Trade Comm’n June 4, 2009), http://www.ftc.gov/os/caselist/0823099/index.shtm. Clapping shows how much you appreciated Tracy De Cicco’s story.